Samuel was born in Ramah, in the hill country of Ephraim. Before his birth, Hannah, Samuel’s mother, made a promise to God that if she became pregnant, she would dedicate her son to serve God with the priests in the Tabernacle at Shiloh (1 Samuel 1). Samuel served God by helping Eli, the priest in the tabernacle and a Judge of Israel. One night, God spoke directly to Samuel and he became known across the land as a prophet of God (1 Samuel 3). Samuel served as a judge for Israel. He was very wise and heard from the Lord. He challenged the people to stop worshiping false gods and to worship only Yahweh, the One True God. At that time, Israel was at war with the Philistines and God helped Samuel lead Israel to victory (1 Samuel 7). Samuel appointed his sons to be judges over Israel, but unlike their father, they were greedy and dishonest. 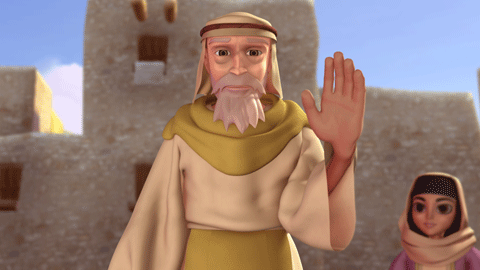 Because his children were so bad and Samuel was getting old, the people of Israel asked Samuel to choose a king instead. God was not pleased with their request since they had rejected God as their king. Samuel warned the people, but when they insisted on their own way, God allowed Samuel to select a king for them (1 Samuel 8). God instructed Samuel to anoint Saul as King of Israel. Later, when Saul disobeyed Him, God led Samuel to anoint David as the new King of Israel. It was some point after this that Samuel passed away in his hometown of Ramah. • Listen to God and obey Him — always. • Encourage others, especially your family members, to believe in God and to obey Him. • If you have turned away from God, ask for forgiveness and worship Him. Help others to do the same.